Consuming plenty of water or other fluid without caffeine a few hours before blood is drawn can often make finding your veins simpler. To help reduce bruising apply pressure to the injection spot after the needle is removed for five minutes. Butterfly needles have been reported to be less painful than standard needles. Ask your clinic if you can try one to see if it is beneficial for you. If you are taking any blood thinning medicine such as aspirin or heparin you will need to keep pressure on any blood draw or IV site for longer than you normally would. Tegaderm or Nexcare bandages are often are less irritating than others and may offer relief if you develop a tape allergy. If you have a particular area that is easier to draw blood from let your nurse know as this general area can be used a few times. To help stop you from developing a tape allergy remove the bandage after half an hour of the blood draw unless you are on blood thinners, then you should wait an hour or so in case of any prolonged bleeding. Clean the top of any medicine vial with an alcohol swab before drawing up the medicine. Icing the area prior to injection may help reduce any injection pain. 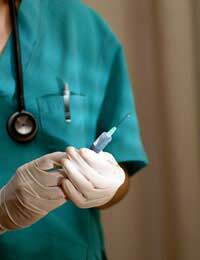 If you suffer badly from injection pain, you can request local anaesthetic cream to dull the pain of the needle. This will not remove all pain as the introduction of the medication to the body can also cause pain. Sharply tapping the injection site for a few seconds will numb it slightly before the injection. Applying pressure to the injection area for 60 seconds prior to injecting can help reduce pain. Remember to clean the area afterwards with alcohol. Some people report that lying down during injections helps. For sub-coetaneous injections, try both the stomach and the thigh as you will probably find one of these sites more preferable. Make sure that you have a medication chart listing all your daily drugs. Leave the dosages blank so that you can fill this in when your clinic informs you. You can also mark off each dose when taken. Intra-muscular injections can be very painful if you do not use the correct spot. Ensure that your nurse shows you where to administer and also draws a circle on each hip to help you hit the correct spot. Read medication labels carefully and check with your pharmacist about any storage requirements, especially refrigeration. Practice filling and emptying the syringe using an extra bottle of diluting agent. Do not actually inject yourself whilst practising. For intra-muscular injections to the hip, try to relax the muscle at the injection site by leaning over a bed and putting your weight onto your other leg. This should help reduce any injection pain. When using the glass ampoules, put them out on a clean paper towel and use another clean paper towel to break them. Then, once they are used, you can dispose of the glass tops by folding them into the paper towels. This avoids having little shards of glass all over your table. For Luperon injections, insulin syringes seem to work especially well, because they come with very small needles.